To us, going green means getting rid of unnecessary packaging that will only end up in our overcrowded landfills. It also means using a more environmentally friendly soy-based ink to print all of our materials. Yes, we know we could have taken the easy route and used the same old petroleum-based ink as everyone else, but that is not who we are. We believe in taking those extra steps to bring products that are better for you and for the earth. 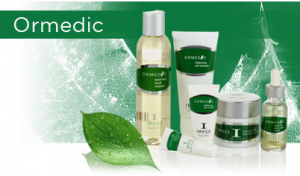 We also offer a line of products that use a new concept of combining organic ingredients with medically effective ingredients called the Or-Medic line. What does that mean to you? It means that these products contain pure ingredients that were grown and raised without the use of chemicals and are free of synthetic ingredients. All of your favorite Image Skincare products are also free of chemical preservatives, such as parabens, which some believe contribute to possible health problems, such as increased estrogen activity. It is our hope that in the end our products can help create both a more perfect you and lead to a more perfect earth. Hey! I’m kinda new to this blog and IMAGE Skincare… I’ve been following it for a few days but haven’t commented yet/ Just wanted to say a big thank you for all this amazing skin care advice in addition to your products :). I’m so excited to try them! Interesting. I knew that natural skin care products were good for your skin but I didn’t ever think they were also good for the earth. My skin is highly allergic to makeup, skin products, everything. So anything all natural that won’t irritate it is great in my books :). I really appreciate this post because I have very sensitive skin and only use natural products. I’m hoping that companies start always making all natural products or as close to it as possible so that we can all help our skin and the earth :). “To us, going green means…” – I like the way you think about the whole ‘going green’ issue. Using the say-based ink is a very good idea. Thanks for sharing the information with us. Ouch :/ I always feel like I have bad skin but I look at thnigs like this and realize its acually really clear.. What would you suggest is a good way to mosturize skin? My nose is always really dry and peels. I’m 16 so I know that the few pimples I get are mostly caused by hormones, sweat from playing sports, make-up, fatty foods, etc, and I used proactiv’s 3 step system plus a daily mosturizer but my skin still gets very dry..﻿ Any tips?? Thanks!